In 'Step 6: Alerts', you can set alert thresholds for certain KPIs. An alert threshold represents a critical level which may indicate that the business is experiencing financial stress in a given area. As an example, an alert may trigger when 'Accounts Receivable Days' exceed a specific result, or when the cash held by the business drops below a certain amount. Each alert can either be turned ‘on’ or ‘off’. For those that are turned 'on', you can specify an alert threshold. When an alert is triggered, a notification appears within the Fathom analysis tools and reports. 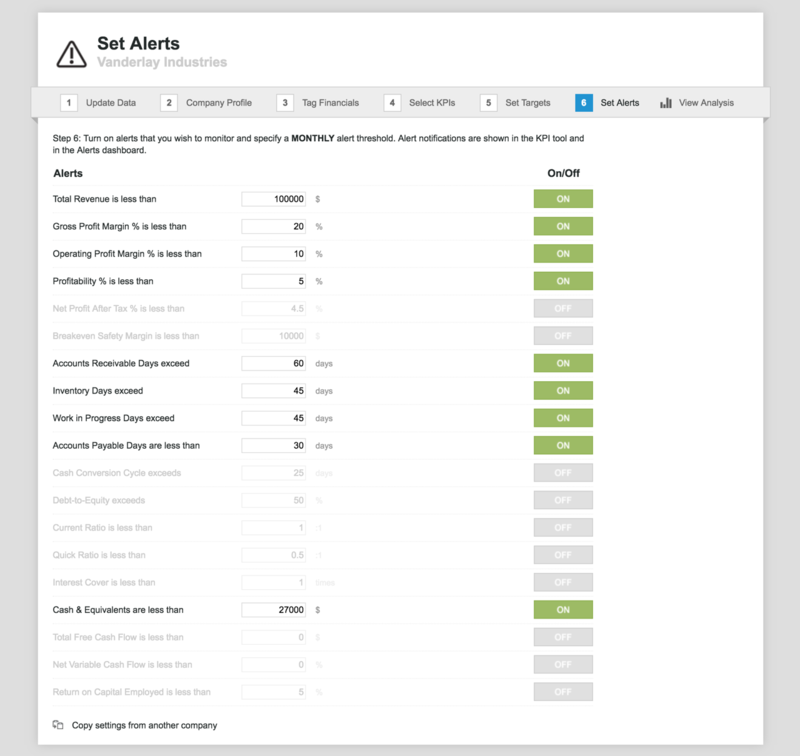 Alerts are visible in the KPI Analysis tools as well as the Alerts dashboard. The setup process is now complete. Click on 'View Analysis' to access the company analysis. This might also be a great time to Share Access with teammates (or clients) so they are able to view the company in Fathom.